The Lao People's Democratic Republic is a mountainous country with the Mekong River forming its border with Thailand. Laos Travel and Tourist Information with links to official travel and tourism websites and state resources for visitors to Laos. Getting Around Laos, Land of a Million Elephants, Laos Accommodation, Laos Travel Guides, Laos Travel Tips, Luang Prabang, Map of Cambodia and Laos, Travel Around Laos, Vientiane, Visiting Laos. Countries neighbouring Laos are: Cambodia, Vietnam, China, Myanmar and Thailand. In the mid-14th century the Khmer king at Angkor, Jayavarman Paramesvara, married his daughter to a Lao prince, Fa Ngum, and helped him found the independent kingdom of Lan Xang - Million Elephants - with its capital at Muong Swa; present-day Louangphrabang. Fa Ngum, a great warrior, united the Lao principalities and was frequently at war with both the kingdom of Ayutthaya and Annam. His Khmer queen encouraged the Lao to adopt Theravada Buddhism. The capital of Laos is on the Mekong River, almost opposite Nong Khai, Thailand. After the division of the ancient Lao kingdom of Lan Xang into two kingdoms in the late 17th century, Vientiane became the capital of Wieng Chan. When the Siamese seized control of Vientiane Kingdom in 1827, the city was virtually destroyed. A rebuilt Vientiane was made the administrative capital of the newly created state of Laos in 1946. In a capital with very few street signs, directions are given by the way of traffic lights and various wats. This is the most important monument in Laos; a symbol of both the Buddhist religion and Lao sovereignty. An interesting journey by dusty road, from Vientiane to Savannakhet. The condition of the roads outside of the major towns are appalling, so only those who have to, or enjoy dusty adventures, use them. To travel long distance often means going by truck. The lorry will be carrying anything from rice to petrol, quite likely both, and the passengers sit on top; squeezing in where they can. Because of the terrain and poor land connections, an internal air service is important in Laos. The Mekong river is the main waterway in this landlocked exotic country of less than 5 million inhabitants; as it flows down the entire length of the country. Other smaller rivers such as the Nam Ou, Nam Khan, Nam Ngum in the north, and Se Don in the south all run into the Mekong. Ferries with overnight accommodation are rather basic. For shorter, water trips use the river taxis. Engine-mounted long-tail boats, Thai-made speedboats, and even rowing boats are all available for hire. The official language of Laos is Lao, one of the Sino-Tibetan languages. French is also used in bureaucracy. Numerous ethnic groups have kept their own languages and dialects. Laos has 68 ethnic minorities and some of the most unspoiled countryside in Asia. The hot season, from March to May, is very dry; making some river trips not feasible. The Lao Embassy in Washington DC is located at 2222 S St. NW. When travelling within Laos, from north to south, you'll never find two places that have the same environment and style. From historic temples, lush landscapes and welcoming smiles, the heart of Southeast Asia is waiting to be explored. Luang Prabang is a sleepy town in northern Laos, at the confluence of the Mekong River and the Nam Khan. It was the early capital of Lan Xang, between 1353 and 1545. The French were in town from 1893 to 1954, with Luang Prabang again serving as the royal capital of Laos; from 1950 until the country became a republic, in 1975. Most of the historic temples are between the Phu Si hill and the Mekong River. The Royal Palace Museum is a good place to start, as the displays give you a good idea of the area's history. Prince Phetsarath chose this site for tranquillity, its stunning views of the mighty Mekong River, and the breathtaking landscape of mountains surrounding Luang Prabang. Luang Namtha, Laos' north-western most province, has large and diverse ethnic groups many of whom still live traditional life styles. The main ethnic groups in the area are Tai Yuan, Black Red and White Tai, Tai Lue, Khmu, Rok, Akha, Lanten, Mien and Hmong. Lao National Chamber of Commerce and Industry. This boutique hotel, in Luang Prabang, was the former house of a Lao Royal Princess and has been elegantly renovated to gracefully blend Royal Lao and the classic French colonial decoration themes. When in Laos, make certain to bring a comfortable amount of smaller US dollar notes, as the local currency is too bulky to carry; given the exchange rates and denomination of their notes. Lightly populated, Laos offers visitors a breathtaking array of stunning scenery, history, culture, great food and adventure, coupled with the opportunity to see how its diverse peoples live. 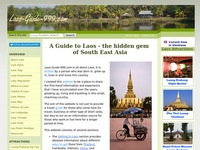 Laos Travel Guides - Laos Maps.